From supporting the then-isolated nationalist community in the Six Counties in the early 1990s to fighting for housing justice today, Brian has consistently stood with oppressed communities and working class people in opposition to injustice, exploitation and inequality. Brian is a former Sinn Féin National Organiser – back in the days before SF’s capitulation to the system. 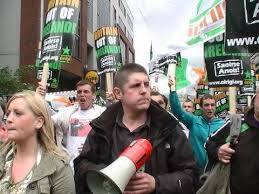 He was part of a small group who left SF in the wake of its decision to sit on policing boards in the north. This group established Éirígí in 2006. As the current Cathaoirleach of Éirígí, he has a proven track record of working with others to advance the cause of a new all-Ireland Republic based upon the principles of democracy, liberty, equality, sustainability and community: a workers’ republic. On Saturday he will expand on Éirígí’s vision of what that new Republic would look like and outline how he would use a council seat if elected in May 2019. The launch is open to all but the organisers would appreciate if you could let them know if you intend coming, so they can plan for seating and eating! Posted on November 16, 2018, in 21st century republicanism and socialism, Anti-household and anti-water tax, éirígí, Economy and workers' resistance, Elections, Irish politics today, Public events - Ireland, Revolutionary figures, six counties, twenty-six counties, twenty-six counties. Bookmark the permalink. Comments Off on Éirígí launches election campaign for Brian Leeson, Saturday, 17 November, 7pm, Mill Theatre, Dundrum.